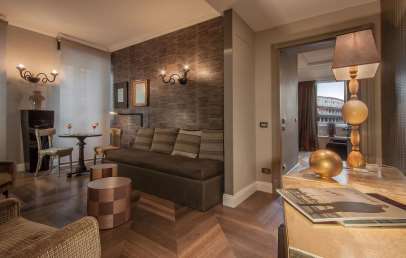 The Hotel Palazzo Manfredi boasts a truly superior location right next to the Coliseum, the Imperial Forum and the Domus Aurea. 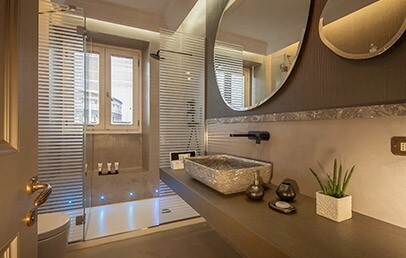 Its pleasant and fascinating position allows you to reach in just 10 minutes the Spanish Steps and Via Condotti. 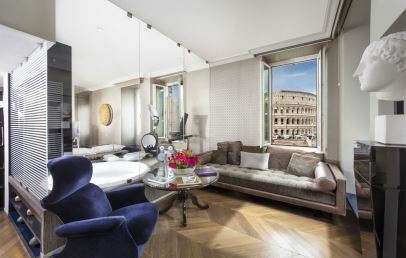 Furthermore, the Palazzo Manfredi promises easy access to the most important historical and cultural sites including the Campidoglio, Piazza Venezia, the Pantheon and the Trevi Fountain, just to cite a few. 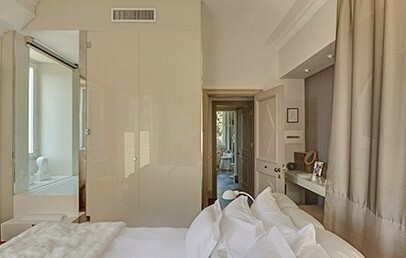 Elegantly restructured with care given to every detail, the Hotel Palazzo Manfredi was an a hunting lodge in the Guidi Gardens. The Engineer and Count Manfredi Goffredo has successfully succeeded in turning an ancient settlement into a refined and exclusive 5 stars boutique hotel. It offers 15 spacious and stylishly furnished rooms and suites available in different typologies: Prestige, Executive, Deluxe, Junior Suites, Studio Suite e Suite Colosseum. On the terrace is located the 5 Star Diamond Award Aroma Restaurant and the American Bar, both characterized by panoramic and spectacular view of Rome. 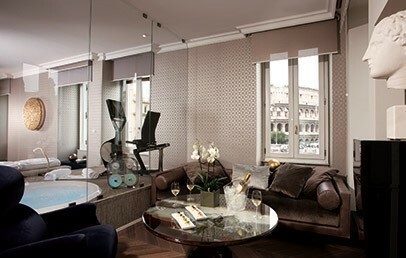 The Hotel Palazzo Manfredi provides high quality services such as free Wi-Fi, à la carte pillows, wellness treatments, personal shoppers, personal fitness trainers and jogging maps. The concierge is at your disposal to organize your excursions, tickets to all major attractions, parties, gala reception and business meetings. Tourist tax: the City of Rome requires the payment of a tourist tax of €3.00 per person/night to be paid on spot. 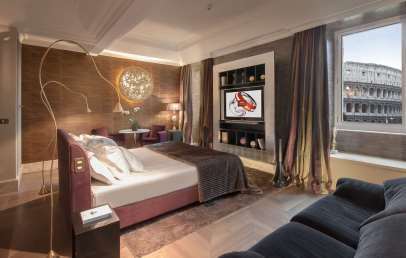 Warm room characterized by velvet and leather fabrics, marble flooring and soft ceiling lamps. They are stylishly furnished by the artists Ingo Maurer and Van Egmond while curtains and drapes are designed by Dedar and Designers. 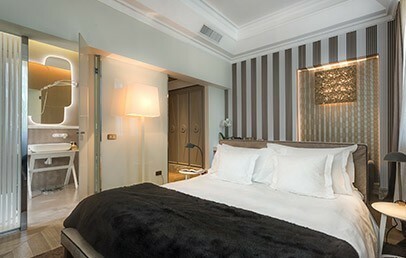 The marble bathroom provides bathtub, hairdryer, bathrobe, slippers and Luxury Battistoni complimentary toiletries. 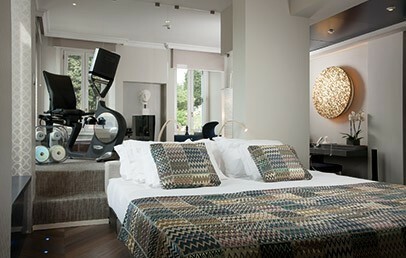 The Prestige rooms have an internal view. 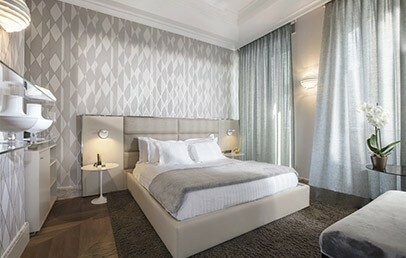 Elegant and warm room characterized by velvet and leather fabrics, marble flooring and soft ceiling lamps. They are stylishly furnished by the artists Ingo Maurer and Van Egmond while curtains and drapes are designed by Dedar and Designers. 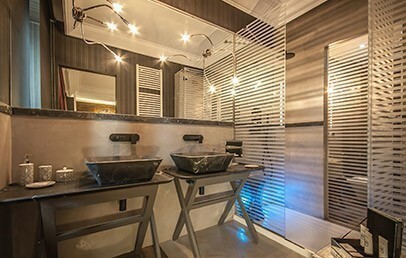 The marble bathroom provides crystal box shower, hairdryer, bathrobe, slippers and Luxury Battistoni complimentary toiletries. 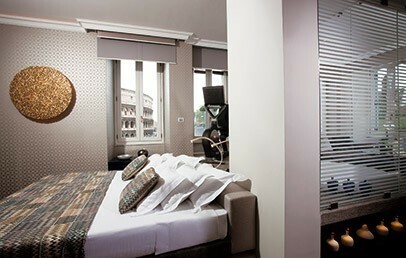 The Executive rooms offer a view of the Domus Aurea and Colle Oppio Park. 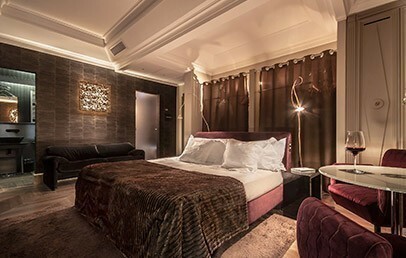 Elegant and warm room stylishly characterized by velvet and leather fabrics, marble flooring and soft ceiling lamps. They are furnished by the artists Ingo Maurer and Van Egmond while curtains and drapes are designed by Dedar and Designers. The marble bathroom provides bathtub or crystal box shower, hairdryer, bathrobe, slippers and Luxury Battistoni complimentary toiletries. 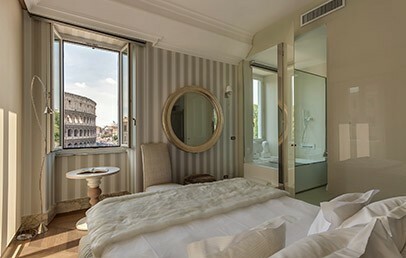 The rooms offer a view of the Coliseum. 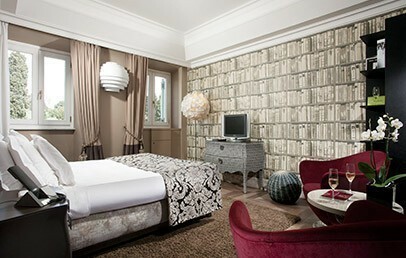 Spacious, elegant and warm Suites characterized by velvet and leather fabrics, marble flooring and soft ceiling lamps. They consists of double room and living area, both furnished by the artists Ingo Maurer and Van Egmond while curtains and drapes are designed by Dedar and Designers. 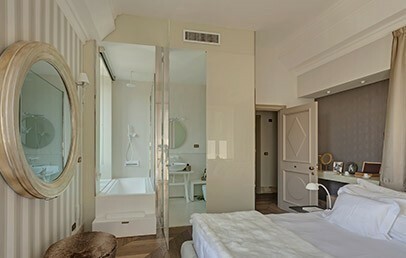 The marble bathroom provides bathtub, hairdryer, bathrobe, slippers and Luxury Battistoni complimentary toiletries. The Junior Suites offer a view of the Coliseum. 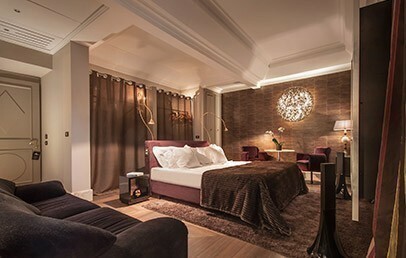 Spacious, elegant and warm Suite characterized by velvet and leather fabrics, marble flooring and soft ceiling lamps. It consists of two separated double rooms both furnished by the artists Ingo Maurer and Van Egmond while curtains and drapes are designed by Dedar and Designers. 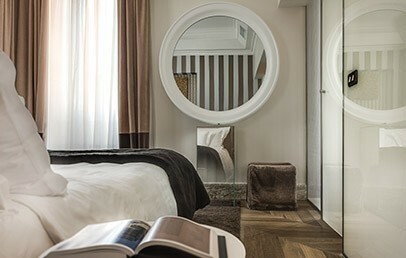 The Studio Suite provides two marble bathrooms equipped with bathtub, crystal box shower, hairdryer, bathrobe, slippers and Luxury Battistoni complimentary toiletries. The Studio Suites offers a view of the Coliseum. 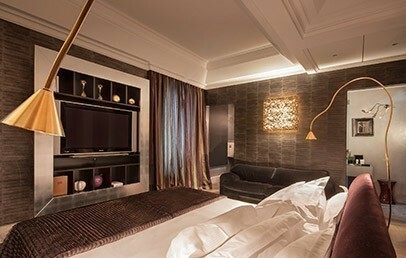 Exclusive, spacious, elegant and warm Suite characterized by velvet and leather fabrics, soft ceiling lamps, wood and tatami flooring. It consists of double room and living room both furnished by the artists Ingo Maurer and Van Egmond while curtains and drapes are designed by Missoni, Larsen e Ivano Redaelli. 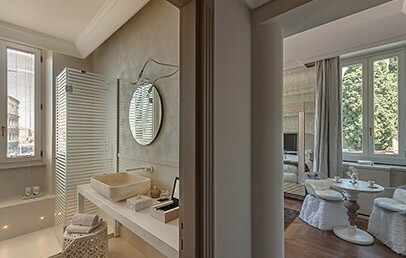 On the upper level area you find a private wellness area with Jacuzzi, hammam, chromoterapy and gym designed by Citterio. 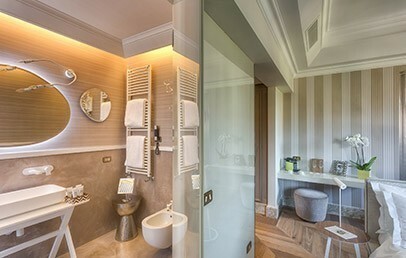 The bathroom is equipped with crystal box shower, hairdryer, bathrobe, slippers and Luxury Battistoni complimentary toiletries. The Suite offers a view of the Coliseum. Only for Charming customers: free upgrade in the higher room category (upon availability) and Welcome Cocktail!